With planks, tiles, sheets and more, vinyl flooring is one of the biggest categories on the flooring market. First things first, let’s get one thing straight: Vinyl flooring today is not the vinyl flooring of the 1970s with dated prints and cheap materials. Vinyl flooring today is full of possibilities, style and class. In this Vinyl Flooring Buying Guide, we’ll discuss the types of vinyl flooring as well as vinyl's uses, construction, looks and installation, and we'll answer your most frequently asked questions, quickly turning you into a vinyl flooring expert. Vinyl flooring is one of the hottest flooring options on the market. Often compared to laminate flooring, vinyl is made from man-made materials to resemble natural sources like wood and stone. 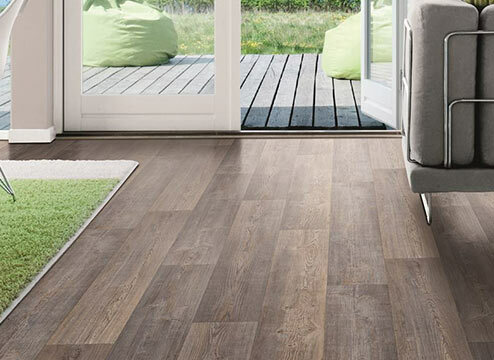 Unlike laminate, vinyl flooring is a huge category with a plethora of different types, installations, constructions and, well, levels of awesome. Vinyl flooring is available in planks, tiles and sheets/rolls. Each type has its own unique look and installation properties. The most popular vinyl flooring option is vinyl plank flooring. 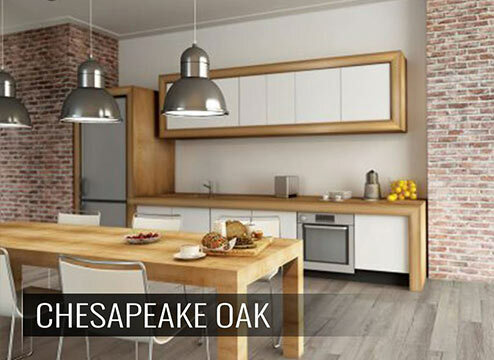 These planks typically mimic the look of solid hardwood, offering a warm, inviting and expensive feel to your home. Today’s luxury vinyl planks even offer the texture and character of trending hardwood options, including handscraped and wirebrushed looks. One of the major benefits to choosing vinyl plank flooring is the easy, approachable, DIY installation. Most vinyl plank options come as interlocking or “floating” floors and simply click together, similar to laminate. Other DIY options include loose lay (the easiest – just lay your floor down and you’re done!) and peel and stick. For high-traffic and commercial installation, you can always glue down your vinyl planks for a permanent solution. 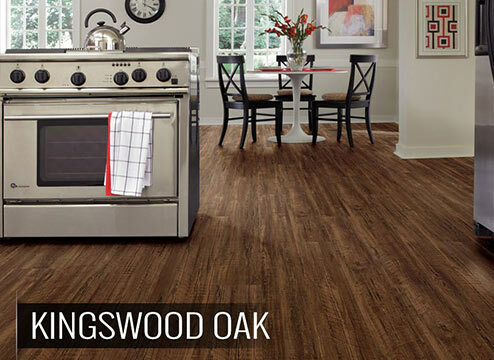 Gorgeous wood looks: Luxury vinyl plank flooring mimics all the most popular colors and textures of solid hardwood. In fact, most people can’t even tell the two apart. Easy, DIY installation: Most vinyl planks offer an easy interlocking or “floating” installation, perfect for most homeowners to do on their own without the help of an installation professional. Comparable to laminate, engineered wood and hardwood: Other types of vinyl flooring can’t truly compare with long-standing industry leaders like laminate and wood. Vinyl planks totally can. Easy to maintain: Vinyl plank flooring is super easy to take care of. Most options are water-resistant and many are fully waterproof. Just make sure you choose a thick wear layer to prevent scrapes and scratches. Waterproof options: Yes, 100% waterproof. They are awesome! Doesn’t feel like real wood: To the touch, vinyl feels pretty different from solid hardwood. This feel is important to some homeowners. Price: As you move onto waterproof and luxury options, this can run you more than other wood-look options like laminate. But they come with a whole lot more bells and whistles! Low-quality planks scratch and dent easily. If you want a vinyl plank that can stand up to high traffic, family and pets, you’ve got to go with a high-quality plank with a thick wear layer. The cheaper options just won’t hold up. Vinyl tiles, like traditional porcelain and ceramic tiles, often mimic the look of natural stone. Like ceramic tile, vinyl tiles offer the beautiful look of popular stone flooring options (like marble) at a fraction of the price. And with way less maintenance! Vinyl tiles, like vinyl planks, are quite approachable and DIY-friendly. Most vinyl tile options come as interlocking or “floating” floors and just click together, similar to laminate. Other DIY options include loose lay (the easiest – just lay your floor down and you’re done!) and peel and stick. For high traffic and commercial installation, you can always glue down your vinyl floor tiles for a permanent solution. Gorgeous stone looks: Luxury vinyl tile flooring mimics all the most popular colors and textures of natural stone. Easy, DIY installation: Most vinyl tiles offer an easy interlocking or “floating” installation, perfect for most homeowners to do on their own without the help of an installation professional. Warmer and more resilient than porcelain and ceramic tile: Great for cold climates, kids and elderly homeowners, these floors offer just a little more give (without feeling cheap) and maintain warmth significantly better than traditional tile. Easy to maintain: Vinyl tile flooring is super easy to take care of. Most options are water-resistant and many are fully waterproof. Just make sure you choose a thick wear layer to prevent scrapes and scratches. Doesn’t feel like real stone or traditional tile: To the touch, vinyl feels pretty different from stone and traditional tile. This feel is important to some homeowners. Price: As you move onto waterproof and luxury options, this can run you more than other porcelain and ceramic tiles. But you can save big on installation. Low-quality tiles scratch and dent easily. 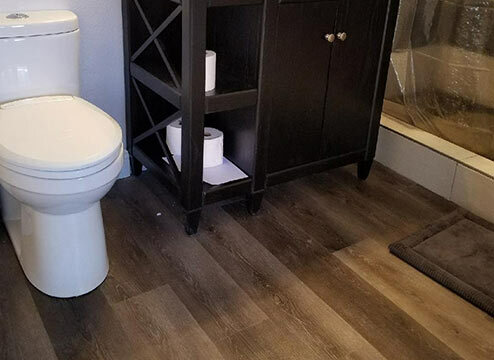 If you want a vinyl tile that can stand up to high traffic, family and pets, you’ve got to go with a high-quality tile with a thick wear layer. The cheaper options just won’t hold up. Not as popular as vinyl planks: Vinyl planks are known for their ability to mimic wood flooring. With natural stone, you can choose porcelain or ceramic tile or luxury vinyl tiles. Porcelain and ceramic tile are waterproof and sometimes less expensive so vinyl floor tiles haven’t taken off like vinyl planks. Sheet vinyl flooring is commonly referred to as a vinyl roll, because…that’s exactly what it is! A big roll of vinyl flooring that you lay over your subfloor. Vinyl sheet flooring is the original vinyl flooring option. It’s what people usually remember when they think about vinyl flooring. Although it comes in a variety of looks, including wood and stone, this flooring is not quite as convincing as planks or tiles because it is in sheet form. However, vinyl sheet flooring is typically super affordable, which makes it a popular choice for commercial spaces. Unfortunately, vinyl sheet flooring usually requires a professional installation using specific techniques that are not super approachable for the DIY homeowner. Inexpensive: There’s no question – sheet vinyl is the least expensive vinyl flooring option on the market. Wood and stone looks: And even more! The styles and designs in vinyl sheets are endless and many of them look really wonderful. Great for commercial spaces and large areas: Because you can cover a large space at a low cost, these babies end up being very popular in commercial environments. Not DIY-friendly: When it comes to installing sheet vinyl, we recommend you leave it to the pros. Looks aren’t as realistic as tiles or planks: While there are many nicer looking luxury vinyl sheets available, they won’t look quite as beautiful as planks or tiles. Doesn’t come in waterproof options: This is one of the main reasons to purchase vinyl – WPC and rigid core! Vinyl sheets don’t offer anything like that just yet. Not common in residential spaces: For the traditional homeowner, we recommend sticking to planks or tiles. Vinyl flooring is known for its versatility. This type of man-made flooring can be specially designed to suit just about any application. In fact, you’ll find vinyl just about everywhere, including homes, apartments, business offices and even grocery stores. Have you noticed your local market looks like it got a big upgrade with hardwood floors? Shhh…it’s almost surely vinyl. Homeowners love vinyl’s gorgeous wood and stone looks, easy DIY capabilities, low maintenance and affordable price point. Once upon a time, hardwood, laminate and tile were the only acceptable options for a gorgeous floor in your home. 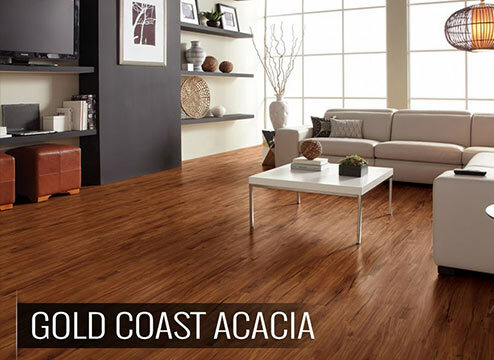 Luxury vinyl flooring is the fastest growing flooring option on the market. Now, you’ll see homeowners of all ages and lifestyles updating their homes with beautiful, durable vinyl floors. vinyl flooring’s benefits far outweigh the dated idea that vinyl is somehow tackier than laminate or other man-made options. The commercial sector is kinda where vinyl flooring has always hit its stride. I mean, it’s super durable and quite affordable – two priorities for most business owners. As vinyl has expanded with new waterproof core and rigid core options, it has skyrocketed in the world of commercial flooring. 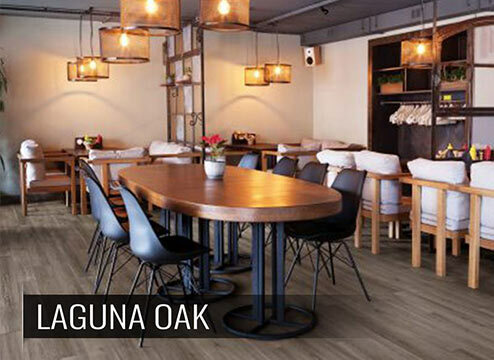 Vinyl flooring now makes it possible to display a realistic wood look in temperamental spaces like commercial kitchens, restaurants and grocery stores. 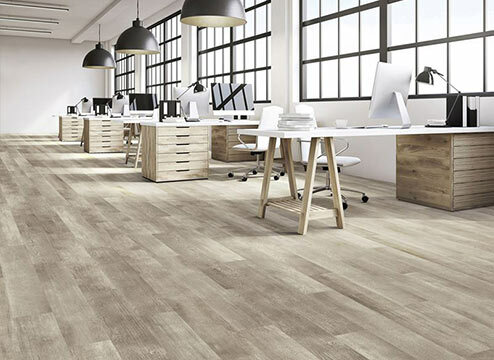 For commercial use, you’ll want to check out a WPC or Rigid Core vinyl flooring option with a thick, durable wear layer to hold up to the heavy foot traffic and wear and tear of a commercial application. One reason why vinyl can be a confusing flooring subject is that there are so many different types. LVT, WPC, Rigid Core…the list goes on, and usually with confusing abbreviations that leave the average consumer scratching their head wondering where the heck to start. Let’s break this down so you have a better idea of where to begin. Your traditional vinyl flooring is, for lack of a better term, the bargain pile. It encompasses non-luxury vinyl sheets, peel and stick vinyl tiles and planks, and all non-luxury vinyl flooring options. This is where vinyl flooring can get its bad rap. Many people don’t know that there is a whole world of vinyl flooring beyond the bargain barrel. 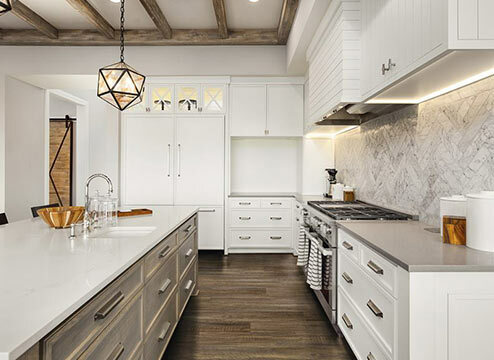 These traditional vinyl flooring options are typically thin, bendy and unrealistic in their wood and stone looks compared to modern-day luxury vinyl. They are great for a cheap vinyl flooring option and covering small, low-traffic areas, like closets. But for beautiful looks that last? You’ll want to take a step up into the luxury vinyl world. Price: This is your bargain vinyl. You can get it as low as $1/sqft. 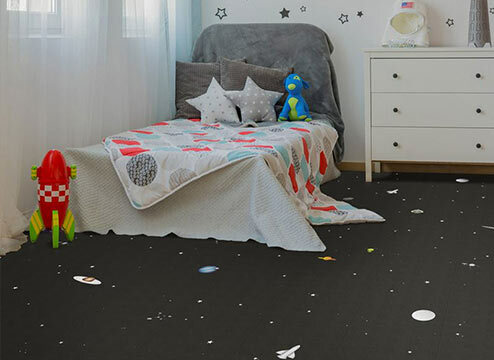 Great for temporary flooring or low-traffic spaces: When you don’t want to install a permanent new floor or have a small closet or low-traffic space, these babies can be a great choice. The peel and stick options are especially popular in closets and rentals. Thin wear layers: The wear layer is what protects your floor and keeps it looking sharp. These thin wear layers cannot stand up to high traffic, families or pets. No waterproof options: One of the biggest reasons to go vinyl is for the waterproof stuff. You won’t find that in traditional vinyl. Less durable than luxury vinyl: It’s just not designed to last for the long haul the way luxury options are. Can look cheap or fake: For a realistic, natural look, you really have to go up to luxury vinyl. Some may contain phthalates or other chemicals: This is true of all vinyl, but WPC and rigid core options often undergo extra testing to ensure they are free of harmful chemicals. Make sure you check the particular product for information on this. Luxury vinyl flooring encompasses the majority of vinyl plank flooring and vinyl tile flooring you see on the market today. The biggest thing that differentiates luxury vinyl from traditional vinyl flooring is the realistic visuals. Luxury vinyl flooring, often referred to as LVF, features a high-quality printed vinyl layer with those stunning natural wood and stone images that make the floor shine. It also typically comes with a thicker, beefier wear layer that protects these images from scratches, dents and overall aging. Most luxury vinyl flooring comes with easy, DIY installation options and, often, great manufacturer warranties. 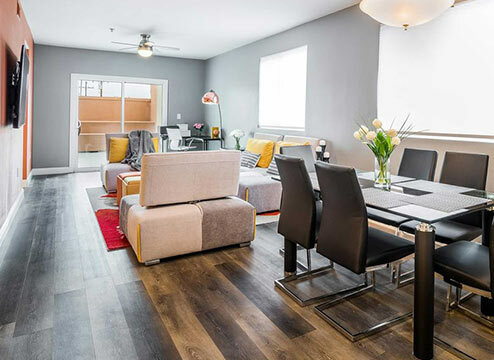 Depending on the quality of the vinyl (even the luxury vinyl flooring world has a lot of variance), you can install luxury vinyl flooring in both residential and high-traffic commercial spaces. 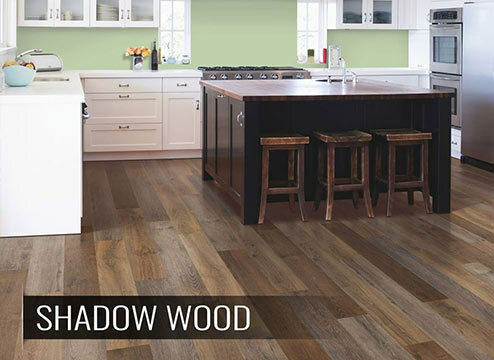 Still nestled neatly under luxury vinyl flooring, we have LVP flooring, which means luxury vinyl planks. This, like the name suggests, is any type of luxury vinyl that comes in plank form. Most LVP flooring mimics the look of solid hardwood. 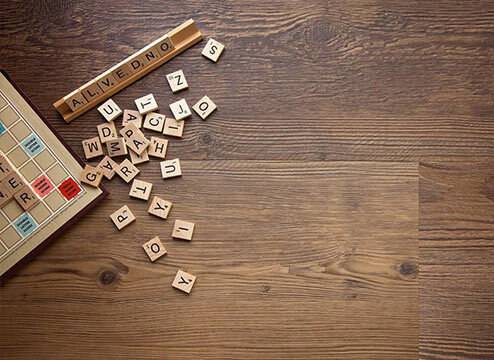 If you’re looking for an alternative to solid hardwood, engineered hardwood or laminate, LVP flooring is the way to go. This vinyl can look almost exactly like wood at a fraction of the price. And now, LVP flooring’s counterpart: LVT flooring. In what I’m sure comes as no surprise, LVT stands for luxury vinyl tile flooring. That is, any type of luxury vinyl in tile form. Most LVT flooring mimics the look of natural stone. If you’re looking for an alternative to natural stone or traditional tile, LVT flooring is your best bet. 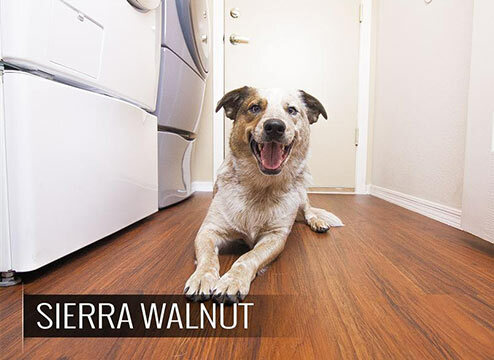 Many homeowners choose LVT flooring for its DIY installation, warmth and resiliency. Beautiful visuals: High-quality visuals are the biggest distinguishing factor between traditional vinyl flooring and luxury vinyl flooring. Expect to find gorgeous wood, stone and designer imagery here. Thicker wear layers: The other determining factor when qualifying luxury vs. non-luxury vinyl is the wear layer. This is like the bodyguard for your floor, protecting it from scratches and dents. Luxury vinyl comes with a thicker wear layer which makes it ultimately last longer. Typically low-cost: Luxury vinyl is more expensive than traditional vinyl, but it is still a relatively low-cost option with many products starting under $2/sqft. Often water-resistant: Most vinyl flooring is built to withstand spills without swelling or buckling as long as spills are cleaned up in a timely manner. Low-maintenance: Vinyl flooring is easy to take care of. No staining or sanding like solid hardwood or intense upkeep that natural stone brings. Just sit back and enjoy your floor. Not waterproof: While luxury vinyl is typically water-resistant, it’s not 100% waterproof like other vinyl options. If you’re looking for flooring for your bathroom or a flood-prone area, you’re better off going full waterproof. WPC is flooring industry lingo for Wood Plastic Composite. Sometimes people use it to abbreviate Waterproof Core, which also works because WPC vinyl flooring does come with a waterproof core. Yes, that means WPC flooring is 100% waterproof. It is luxury vinyl flooring amped up a notch with a special waterproof core that makes it perfect for just about any room in the house and for any business. Waterproof vinyl flooring is also known for having top-tier imagery with the most realistic wood and stone looks available on the market. 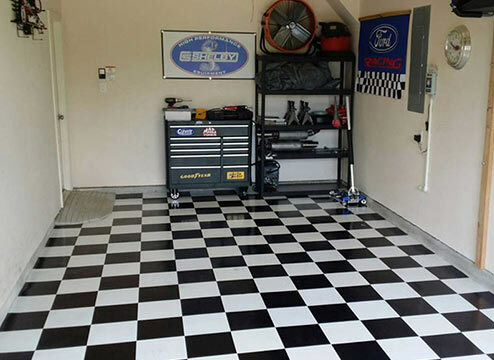 It typically comes as a DIY-friendly interlocking or “floating” floor, but it can also be glued down for a permanent solution. 100% waterproof: I mean, this is the trademark of WPC vinyl. Only WPC and rigid core vinyl are fully waterproof. That means you can install it in any room, at any level. Great for imperfect subfloors: Little known fact: Because WPC vinyl is so thick and durable, it can hide an imperfect subfloor. I know, I know, you don’t care what the subfloor looks like. But do you care about dropping a bunch of extra money leveling it beforehand? With WPC vinyl, you oftentimes won’t have to. 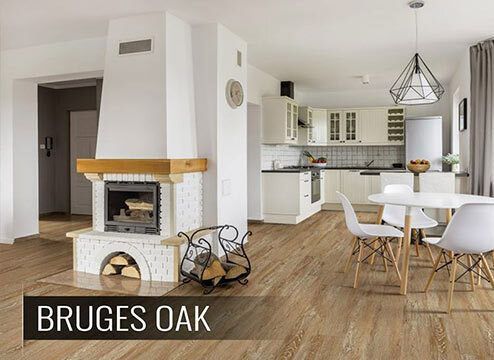 Realistic wood and stone looks: WPC and rigid core are both known for having the highest-quality visuals on the vinyl flooring market. Zero maintenance: All you need is the occasional vacuum and damp mop to keep your WPC looking fabulous. Kiss the phthalates goodbye: So long, farewell, auf Wiedersehen, goodbye. Many of our WPC flooring options are phthalate-free. Price: More features = higher price tags. But we think it’s worth it. SPC flooring, also known as rigid core luxury vinyl flooring, is exactly what you’d expect: waterproof vinyl flooring with a tough, sturdy, rigid core. The rigid core allows you to install your vinyl floor in areas you wouldn’t normally be able to. You see, most subfloors are inherently uneven. It’s just not common to have a perfectly smooth subfloor hanging out waiting for you to come put your dream floor on top of it. Most of the time you have existing flooring. Or uneven concrete. Or a number of other bumps and hiccups causing your subfloor to be something other than the desired pancake-flat surface most installation instructions call for. This new rigid plank technology helps to eliminate ripples and waves that are often caused by uneven subfloors. Like WPC, rigid core vinyl flooring has the highest quality imagery and the most durable wear layers. It also includes many DIY installation options, as well as permanent glue-down solutions. 100% waterproof: Like WPC, SPC flooring is fully waterproof. That means you can install it in any room, at any level. The best for imperfect subfloors: SPC is hands down the best option for imperfect subfloors. Its rigid core is your best protection from telegraphing subfloor imperfections. Realistic wood and stone looks: SPC and WPC are top notch in their visuals and imagery. Zero maintenance: All you need is the occasional vacuum and damp mop to keep your rigid core luxury vinyl flooring looking fabulous. Kiss the phthalates goodbye: So long, farewell, auf Wiedersehen, goodbye. Many of our SPC flooring options are phthalate-free. Back in the day, vinyl flooring had a bad rap. Old, 1980s materials often included chemicals that were later not recommended for air quality and family health. But! It’s the 21st century. Manufacturers have come a long way in making their flooring options safe and family-friendly. Here’s a look at some vinyl flooring options you can look for to ensure your floor is safe and chemical-free. Phthalates are chemicals sometimes used in vinyl flooring to make the floor softer, more resilient and more flexible. Although vinyl flooring that contains phthalates isn’t proven to be unsafe, it’s not a naturally occurring property and many homeowners prefer phthalate-free flooring options. Not all floors are specifically tested for phthalates. For this reason, it’s often difficult to tell which floors contain them. Floors that are not certified phthalate-free do not necessarily contain phthalates. But they could. If you’re looking for a fully certified phthalate-free vinyl floor, you’ll find that in many of our WPC flooring options. Check the product highlights to see whether the product you’re interested in has undergone phthalate testing. California has been leading the way in the indoor air quality initiative. The FloorScore certification signifies that a particular product has been certified safe for indoor air quality according to California’s standards. So, basically, it meets the highest level of criteria. FloorScore certified vinyl floorings have been tested and certified to declare that they are free from harmful chemicals that contribute to poor indoor air quality and safety issues. It’s a quick way to ensure your family’s safety when you purchase your floors. 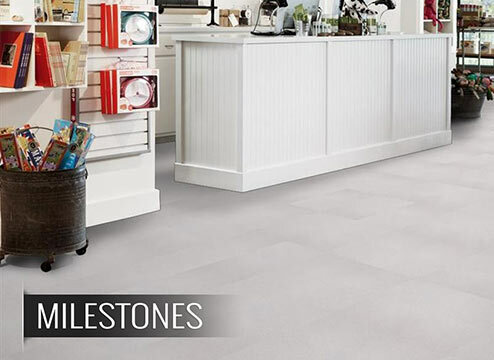 Many of our high-quality WPC flooring options, like TritonCORE, are FloorScore certified to provide a worry-free shopping experience and healthy air in your home or business. Finding the right floor is kinda like finding the right pair of running shoes. The most important part is how well it will perform and hold up to the elements. Functionality is key. Really though, you just want the pretty one. I know. This is every runner’s struggle. But it doesn’t have to be yours! The great news is you can find vinyl flooring that meets all your criteria and still choose the look that’s right for you. There are so many gorgeous natural-looking options at every price point that you’re sure to find the perfect look. In the perfect color. At the perfect size. Wood looks are most common in vinyl planks. 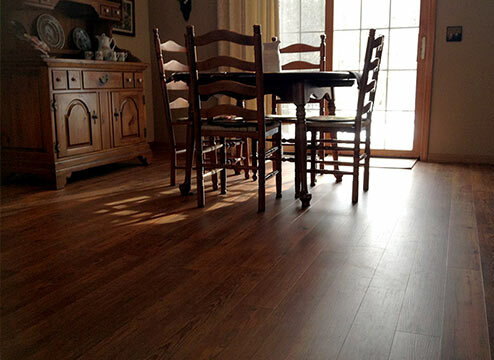 Although wood-look vinyl has previously appeared cheap and dated, recent technological advancements have achieved looks that parallel real hardwood. Top-notch options like WPC and rigid core vinyl flooring even have the feel of real hardwood, complete with the look of graining and knots that have been given an emboss following the pattern in the print. Stone-look vinyl flooring will not have the cold, hard feel of natural stone or ceramic tile. Instead, you get vinyl’s comforting warmth and resiliency with the realistic, upscale look of natural stone. Luxury stone-look vinyl flooring is shockingly realistic and looks stylish in any modern home. Homeowners typically choose vinyl over ceramic tile to get the aforementioned warmth and resiliency. Vinyl, like tile, is ultra-durable; however, vinyl is way more comfortable underfoot. From the classic black-and-white checkerboard floor to space and even stars and stripes, there are plenty of fun, unique vinyl flooring options perfect for classrooms, kids’ rooms and more. You can find vinyl flooring options mimicking all the hottest colors in natural stone and wood flooring colors, such as white marble, chalky slate, hickory or acacia wood, etc. Find trending gray looks or go with an airy blonde wood or white stone. You can also find fun, bright colors in decorative looks for something a little different. These options don’t typically resemble your natural materials, but they’re a fun upgrade if you’re looking for that splash of color. You can even filter your search by color if shade is a determining factor. *Tip: Lighter colors will make your room look bigger. 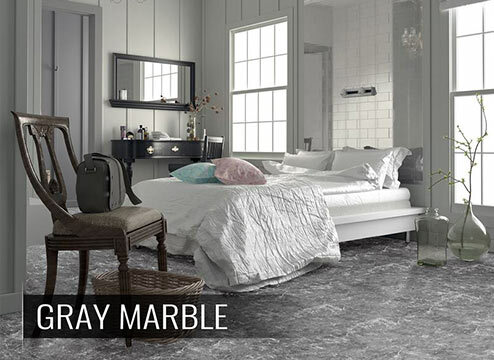 Check out the marble stone blonde or wood looks. DIY-ers can install vinyl flooring in several different ways. Many of them are DIY-friendly. Let’s take a look. The true DIY dream, peel and stick vinyl tiles and planks go on your floor just like stickers. Simply remove the backing and stick the adhesive side of your vinyl directly on your floor. If you passed kindergarten, you can install these babies! Okay, this might be even easier than peel and stick! Loose lay vinyl flooring requires no adhesives or locks. The flooring has a gripped backing that stays snug against your subfloor so you simply lay the vinyl down on top and voila! Your work here is done. We do recommend including tape around the perimeter to hold things in place. Loose lay application without an adhesive is not appropriate for commercial applications. Interlocking or floating floors are one of the most popular DIY options on the flooring market. This style mimics traditional click-together laminate floors. 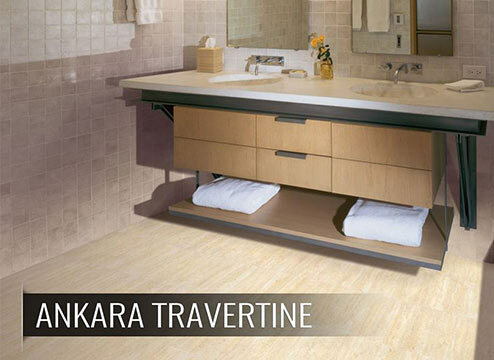 To install these floating floors, simply click and lock your tiles or planks together. Each product comes with specific manufacturer instructions to lead you to success. Interlocking vinyl planks and tiles are extremely popular with the DIY homeowner because you can achieve a professional look and feel without calling in the experts. Glue-down vinyl flooring is especially popular in high-traffic commercial spaces. Gluing down your vinyl is the best way to ensure the sturdiest permanent solution. While you can take this project on yourself, we recommend most customers seek professional help. If you want a stone look without the stone, groutable tiles are the way to go. These look like real stone, and with the extra capabilities of adding grout, these might as well be real stone. These tiles can be installed using the glue-down method or using double-sided carpet tape. The next step is adding the grout. Find an LVT-friendly grout for your tiles, and grout them just like you would a real stone tile. Pretty cool, right? There are two main factors that determine the quality of your vinyl: thickness and wear layer. It’s pretty simple, thick vinyl + thick wear layer = higher quality*. Of course, this doesn’t mean you need 8mm vinyl flooring for every use – every situation is different and has different requirements. Even the highest quality WPC vinyl floor needs protection. Think of the wear layer like your vinyl’s bodyguard. Do you want Screech from Saved by the Bell keeping you safe, or do you want The Rock? A thinner wear layer means your floor is much more susceptible to scratching, scarring and damage. If it’s in a low-traffic area, you can get away with it, but on a floor that will be lived on, we don’t recommend skimping out on this piece of the puzzle. *This is usually true. However, new rigid core vinyl flooring comes in a thinner plank with an ultra-thick wear layer. This vinyl flooring has been specially engineered to withstand high-traffic commercial areas in a thin plank. It’s the exception to the rule. Q) How much does vinyl flooring cost? A) Vinyl flooring cost varies by type. You can find peel and stick vinyl tiles for as low as $1/sqft and luxury WPC flooring up to $7-8/sqft. I know, it’s quite a range. With that being said, I’ve pulled the basics of vinyl flooring prices. I’m estimating the vinyl flooring cost based on 1,000 square feet. Q) Is vinyl flooring safe? A) As far as safety goes, most homeowners are referring to phthalates and other chemicals that can be found in vinyl flooring. The truth is, some vinyl does contain these chemicals. If you want to ensure your vinyl floor is safe, check for the FloorScore certification. You can also look under product highlights to find certified 100% phthalate-free vinyl floors. Q) Is vinyl flooring cheap? A) Well, that depends how you mean “cheap”. And really, which type of vinyl flooring you’re talking about. Many non-luxury vinyl floors, such as peel and stick vinyl flooring, are quite inexpensive and not super durable. These are not the types of vinyl floors that compete with traditional hardwood and stone. However, luxury vinyl flooring and particularly WPC flooring and rigid core luxury vinyl flooring are anything but cheap! These high-quality products are more durable than many natural materials and can come at a fraction of the price. Q) How to clean vinyl flooring? A) To clean your vinyl floors, be sure to vacuum up any dust, dirt or debris. It’s best to use a vacuum without a beater bar for this. You can also use a damp mop to keep your vinyl flooring clean. Be sure to clean up any spills immediately to prevent damage to your flooring. Q) Can vinyl flooring be used outside? A) Even if using waterproof vinyl flooring, we do not recommend vinyl flooring for outside or semi-outside areas. UV rays can cause fading and continuous weather can damage the flooring over time. Using vinyl flooring outside may also void the manufacturer warranty! For these reasons, stick to using vinyl flooring indoors.